3D printing, as a whole, is becoming more affordable. Several low-cost 3D printer options are now on the market, and even many high-end 3D printers have become relatively less expensive, allowing more people to have access to the technology than ever before. 3D printing is still an investment, however, because of the ongoing cost of materials. If you 3D print frequently, you’ll consistently need to replenish your material stock, and those costs can add up quickly – especially if you have an SLA 3D printer. Resins for photopolymerization 3D printing tend to be on the expensive side, so even if you find an affordable, quality SLA 3D printer, there are still resin costs to contend with. ApplyLabWork a new SLA/DLP resin provider, is aware of this issue, and wants to help you save money by offering affordable alternatives to more costly resins. Based in Torrance, California, ApplyLabWork was founded by a small group of engineers with more than 50 years of combined experience in materials. A wide variety of industry experience is represented by the company’s team, including in textiles, building materials, printing, coating, specialty chemicals, paper, aerospace and composite materials. Clearly a well-rounded company, ApplyLabWork formed with the goal of improving 3D printing materials in terms of functionality, printability and cost. 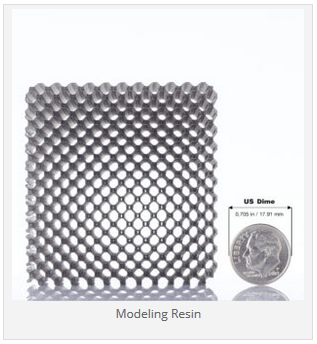 Modeling Resin, which produces finely detailed, high-definition 3D prints with well-balanced tensile and elongation strength that keeps fine prints from breaking easily. ApplyLabWork compares this material to Formlabs’ Standard Resin. Available in beige and black, Modeling Resin costs $60 for one liter and can be purchased here. Modeling Plus Resin, which is comparable to Formlabs’ Durable Resin. This resin is formulated for higher bendability and impact resistance. Modeling Plus Resin is available in olive gray and costs $80 for one liter. It can be purchased here. 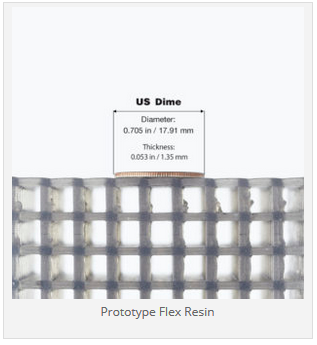 Prototype Flex Resin can be compared to Formlabs’ Flexible Resin, and has excellent elongation and flexibility properties. Designed for engineering requirements, this material can withstand repetitive bending and heavy compression. Prototype Flex Resin is available in metallic and costs $110 for one liter. It can be purchased here. All above pricing includes free shipping to the 48 continental states. ApplyLabWork will be releasing additional resins shortly, including specialty resins and functional engineering resins. All materials are tested on and compatible with Formlabs’ Form 1+ and Form 2 SLA 3D printers. Resins are formulated in ApplyLabWork’s in-house R&D and production facilities, and sold directly from the company to the market. ApplyLabWork is a young company, but one that brings several decades’ worth of collective materials experience to the table. Accessibility is clearly a priority, with a target customer base of designers, engineers and makers who want to 3D print quality SLA pieces without spending too much on specialty resins. When working on prints with fine details, specially tailored resins are particularly important – the type of resin being used can make or break a print. Anyone who has worked with SLA 3D printing will agree that resin quality is not something you want to skimp on, but that doesn’t necessarily mean that you have to break the bank to find resins that produce high resolution, strength and flexibility. It’s an exciting time for resin-based 3D printing right now, with multiple SLA 3D printers on the market at affordable prices. Not long ago, SLA 3D printing was only accessible on an industrial level, but now it’s become much more common among desktop users. As printer prices fall, it isn’t surprising that resins should be getting more affordable, too. ApplyLabWork ships internationally, with free shipping available to the 48 continental states. If you’re interested in learning more about ApplyLabWork’s materials, you can contact the company here. Discuss in the ApplyLabWork forum at 3DPB.com.